When I began competitive shooting almost 50 years ago, the adjustment of your stock was relative to the amount of moleskin you put on it. Nowadays, most competition-grade shotguns are equipped with adjustable combs, ribs and even buttplates. The amount of adjustment options can be overwhelming. I like to start with the adjustable rib. I also prefer to set the rib at about 1/2 between the maximum setting for a high impact and the maximum setting for a low impact. The comb is the next step in getting your adjustability to where your gun is shooting where you look. Remember, your gun MUST shoot where you look! After you’ve made all your adjustments, it’s time to check them on either a pattern board or on the range to see how they are working for you. Trap guns have evolved rapidly over the past few decades. When I started competitive shooting almost 50 years ago, an adjustable stock was dependent on how much moleskin you could affix to the comb. Adjusting the impact of the barrel usually involved a fork in a large tree or giving the barrel a few strong “whacks” over several bags of shot on the tailgate of a pickup truck. Fortunately, most trap guns today come with an adjustable comb and some come with adjustable ribs to change the point of impact (without bending the barrel!). Some high-grade trap guns even incorporate adjustable weight systems to adjust the balance and, therefore, change how the gun “feels” when mounting and swinging to the target. Indeed, all changes for the better. However, having all of these adjustment options can sometimes overwhelm a trapshooter who is just trying to get the gun to break more targets. What follows here is a step-by-step set of suggestions for finding your way through this maze of trap gun adjustability. First of all, some of you reading this article may be at a crossroads of moving from your first trap gun to a more expensive one likely to have more adjustability options. In my opinion, the key to success in American Trap is consistency. To achieve this goal, you must have a gun that is dependable with a good crisp trigger and also fits. The gun MUST shoot where you are looking, without intense recoil, and this comes with proper gun fit. So, at the minimum, I suggest you limit your search to a quality firearm with both an adjustable comb and an adjustable rib. Again, gun fit is crucial to consistency and success in trapshooting. To get started, let me point out some factors about a gun’s point of impact. You will often hear shooters talk about how high or how flat their gun’s point of impact is. As a matter of fact, I would be willing to bet if you asked 10 different trapshooters about “point of impact”, you would probably get 12 different answers. The truth is there are many factors that affect where a gun will shoot. Those are physical factors, such as: visual acuity or how fast you “see” the target, reaction time or how long it takes you to begin moving to the target after acquiring it visually and finally the amount of time involved in making the shot, by either pulling or releasing the trigger. Some factors are inherent in your equipment, such as lock time or how long it takes for the hammer to engage the firing pin once the trigger has been activated. Some guns today have incredibly fast lock times, which will require the gun to shoot a bit higher. Even the speed of the shot charge and the dimensions of a choke tube can influence the point of impact. So how high should my gun shoot? Part of the answer to this question is that in American Trap the target will ALWAYS be on the rise, both when you are moving to it and when you pull the trigger. If you do the math, a typical target, on a calm day, traveling at the proper speed from the house, will rise about 4"-6" (at 35 yards) by the time you pull the trigger and the shot arrives on target. To get a visual of this, place a typical #2 pencil on top of your front bead. The top of the pencil is where the target will be when the shot arrives. Step 1: To set the impact, I like to start at the muzzle end of the barrel with the adjustable rib. When fitting a gun to a shooter, I usually start out about ½ the distance between max up and max flat (see figure 1). Remember, as you lower the rib (closer to the barrel), this will raise the point of impact. Having the initial setting at about ½ allows for adjustment later on. I will explain why ½ is a good beginning later on. Step 2: Involves the comb. I like to set the height of the comb to where the shooter is seeing a “tall” figure 8. I sometimes refer to this as a “snowman”, where the mid bead is into about the bottom quarter of the front bead. It is also important to check the overall height of the comb at this point. Be sure the comb is level, making sure the front of the comb is the same height as the back of the comb. Some shooters like to set the front of the comb lower than the back. I’ve seen some combs that reminded me of a jacked up ’57 Chevy! The logic is the lower the front of the comb, the less chance it has to rise into your face, resulting in less felt recoil. The problem with this is it is very difficult to be consistent, because where you place your face on the comb can actually change the point of impact! So to start out, keep it level! The second thing to check with the comb is to make sure you are lined up straight and the middle bead is NOT sitting off to either the 5 o’clock or 7 o’clock position. You want to be dead on, especially if you are shooting an unsingle barrel. A good way to check is to tape a toothpick (flat ones work best) to the front of the rib. Mount the gun and make sure the toothpick is straight up and down (like a flagpole and not the leaning tower of Pisa). If your toothpick is leaning, check and make sure you have it taped on square to the rib. Also, check your gun mount at this point. If you have been shooting a gun with a lower (non-Monte Carlo comb), you may have learned to shoot with a high, right elbow (for a right-handed shooter) to compensate for this extra drop in the comb. I suggest you may want to remount the gun with a lower right elbow position and see if this brings you back to square. If not, then you want to move the entire comb to make the toothpick look like a flagpole. For example, let’s say you are a right-handed shooter and your toothpick is leaning to the left. Try moving the entire comb to the right until straight up and down. Again, make sure you adjust both the front and back posts to keep the comb in line. Some shooters will have the front of the comb sitting slightly off to one side to reduce felt recoil. Again, this can affect consistency in where you place your face on the comb and impact of your pattern left or right. Keep the comb straight! Many adjustable combs today have hardware with reference marks to help with this alignment. Step 3: You are finished with the initial setup of your gun. From this point, there are two options. Option 1 may involve a trip to the pattern board to make sure your pattern is centered and slightly above (maybe 12") the aimpoint. I like to pattern at 35 yards, with a Full choke (35 points of constriction minimum), and I use a 30" circle as an effective dense pattern. I would suggest you shoot at least two shots of the same ammo into the pattern board to make it easier to “see” your pattern. However, remember what is produced is just a “snapshot” of where your pattern is at the time the shot arrives. Shooting at a spot on the pattern board involves a static or non-moving target. Clay targets are anything but static. Remember, they will move at least 4" vertically by the time you shoot! This is just a visual inspection of the adjustments you have made to your gun and will likely save you a little ammo at the practice trap. Patterning is not the end of the process, but just an optional step at the very beginning. If your pattern looks okay, let’s head off to the practice trap. You will do so with a bit more confidence and a little less doubt about how your gun is performing. Option 2: If a patterning board is not readily available, head off to the practice trap to see how your adjustments are working. I would suggest you shoot a Full choke at 16 yards. Shoot at least 15-25 shots all from Station 3. Carefully watch your breaks with the goal being to produce balls of smoke or at least nice star breaks. For those targets you don’t “smoke”, look carefully at your breaks. Are the majority of the pieces moving up or down, left or right? Remember, the pieces move in the opposite direction of where your shot arrived. If pieces are moving down, your impact is a bit high and vice versa. If you are not sure, have a trusted shooter stand behind you and catalog your breaks. When you can hit at least 85% of your Post 3 targets hard, you are ready to shoot a regular practice. For most shooters, with this suggested setup outlined in this article, you will probably have to lower the rib (making the gun shoot a bit higher). This will bring your beads more “in line” and not give you the “snowman” as described earlier. IMPORTANT: Remember to make only one adjustment at a time and then shoot at least 25 targets to see how that adjustment went. If you change more than one thing, you will never really know which adjustment was effective in getting you “on target”. Be prepared to spend a little time and money investigating your setup at the practice trap. Remember the goal: consistency. 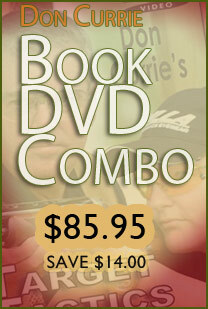 The more you shoot, the more confidence you will attain and the more consistent you will be. Along these lines, you do not want to be that shooter that looks at the gun as the fault of missing targets in one particular event. I’m sure we all know that shooter who is always adding or removing washers to change the height of the comb and, therefore, the point of impact. Always pay attention to your breaks and think long and hard before making a change. Also, if you do decide to try a change, do so at the practice trap, not during the event. Finally, if you are still unsure about where your gun is shooting and don’t know what else to do, seek qualified help in getting you on target. Several gun manufacturers have pro-staff individuals available at larger tournaments to help shooters with their setup. These individuals usually know best how their guns perform and can easily recognize the changes that need to be made to accommodate your setup. Dean Townsend attended his first Grand American in August of 1968. In August 2017, he will be attending his 50th Grand American. He shot his first Grand American in 1970 at 12 years of age. He currently holds five state titles in his home state of Ohio and has been named to over 20 All-Ohio state teams. He has also served two terms as a member of the Ohio Trapshooting Board of Directors, as well as two years as Ohio ATA delegate; been a member of eight different ATA All-American teams including, Sub-Jr, Men’s second team and both 1st and 2nd Sub-vet teams. In 1993 he was appointed to the ATA Central Handicap Committee by then President Jim Bradford. He served in that position for 17 years until 2010. At that time, he was asked to serve as Chairman of that committee, a position he currently holds. He is also a six-year member of the ATA rules committee. During the past four years, he has been a member of Blaser-USA’s pro-staff, assisting with customer service issues and helping shooters set up demo guns at several major tournaments around the country. He retired after 35 years of teaching high school and college chemistry in May of 2015.